Have you ever heard the saying, “fish is great brain food”? Well, while there’s little solid evidence to support the aphorism, there’s no denying that eating fish positively affects your health. In fact, nutritionists generally agree that you should eat at least 2 servings of fish per week. Here are some of the biggest reasons you should add fish to your diet. Omega-3 Fatty Acids- Many types of fish contain the magical oil known as omega-3 fatty acids. Ok, so it isn’t magic, but it offers your body many proven benefits. Perhaps the main benefits of omega-3 are that it plays a large role in keeping your arteries free of blockage and lowers your blood pressure. In turn, your risk of heart disease and stroke drops. They also help reduce inflammation in your body. As a result, you stand less of a chance of developing arthritis, diabetes, and cancer. Some even speculate that omega-3 might actually aid in brain development. Fish especially high in omega-3 are salmon, tuna, and trout. Low Saturated Fat- Good fat, bad fat- what’s the difference? The omega-3 found in some fish is a type of polyunsaturated fat, a good fat. On the other hand, saturated fat causes problems if you eat too much of it. While your body does need small amounts of saturated fat, you want to limit it to less than 10% of your caloric intake. Unfortunately for you carnivores, most meats are packed with high levels of saturated fats- but not fish. So when you choose fish over beef, you’re cutting out the artery clogging saturated fat. Vitamins- Many varieties of fish also meet daily vitamin requirements. One serving of salmon, for instance, gives you 100% of required vitamin D and 50% B12. Canned fish such as sardines contain soft, digestible bones that provide your body with much-needed calcium. Other fish like halibut provide you with almost a quarter of your daily dose of magnesium, which helps calm you and keep you regular. Protein Packed- Substituting fish into the rotation a few days a week allows you to get away from some of the more standard, fatty sources of protein like beef. Fresh fish contains complete protein sources with all the amino acids your body needs to maintain a healthy metabolism. With an up and running metabolism, your body will use the protein as fuel for weight loss. Versatility– Bake it, grill it, sear it- you can pretty much cook fish any way you want! You can even roll it up raw with rice- sushi anyone? Just do yourself a favor and stay away from the fryer. 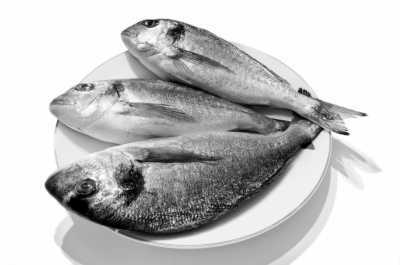 Frying fish counteracts the health benefits you want to obtain from your fish. Warning– While eating fish offers many benefits to your health, consuming fish in exorbitant amounts can lead to mercury poisoning. Luckily, you mainly only have to worry about mercury in larger fish such as shark and swordfish. Albacore tuna also presents a possibility for mercury poisoning and should be eaten in moderation. However, more common fish such as salmon, catfish, and canned light tuna have minimal levels of mercury, allowing you to indulge with little worry. With so many health benefits, you can’t go wrong with fish. What type of fish do you prefer and how do you like it cooked? I love fishes!! 😛 When I was small I was not eating fish at all but now I really enjoy eating fish. Love the canned sardines with olive oil and lemon juice!! So you have right, we should eat lot of fish, they have not to much fat, but lot of proteins. @ Jack Unijne– Agreed. More fish, less fat! What about the fact that fish are completely overfished and if you buy them from big companies they are completely unethical? I suppose you could buy them from the local fishmunger, but most fish are endangered now so he can’t be completely sustainable. Just look to the longevity of the Japanese people to see the effects of a diet with a bias towards fish. Check out the best fat free way to prepare fish at Spanek and you will discover a new adventure.